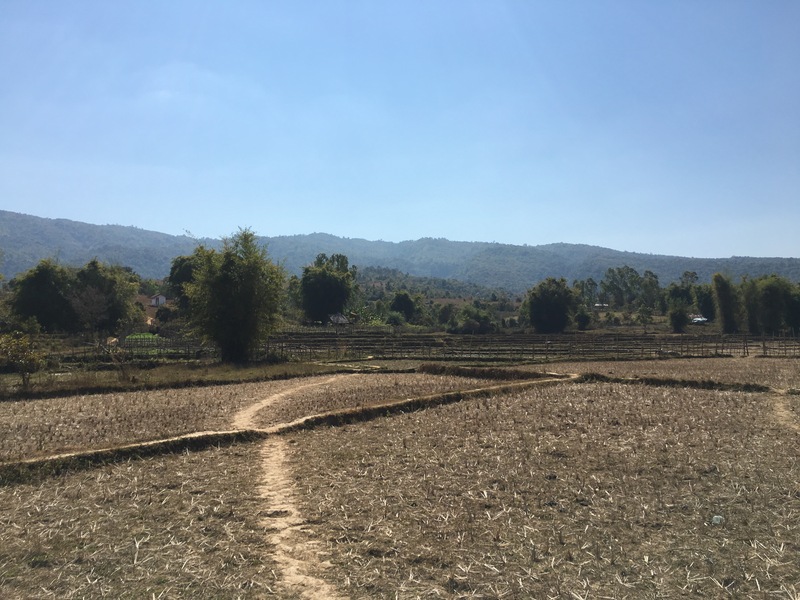 Situated in the Xiangkhoang Plateau outside of the city Phonsavon lies the three main jar sites. Each with unique and breathtaking views of the surrounding areas. 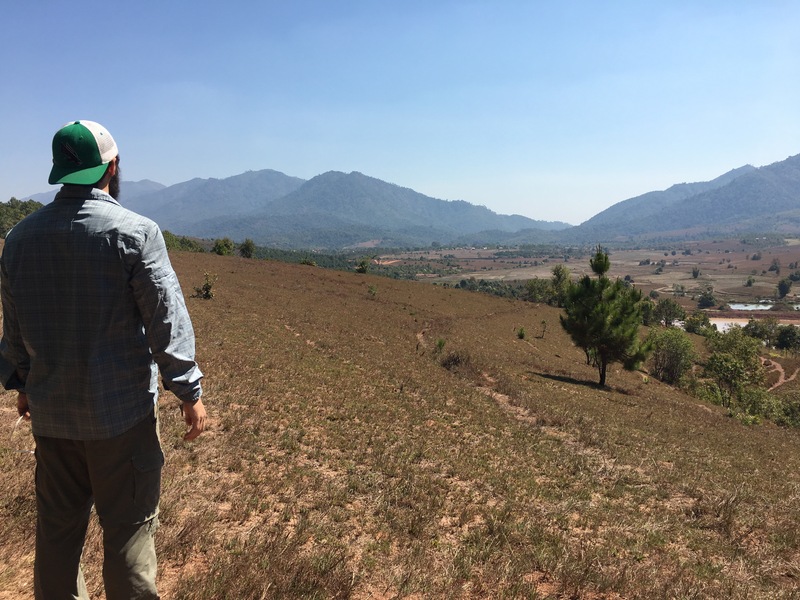 These sites are still actively being excavated and studied to find out their exact purpose in the Laotian culture. Archeological evidence supports the conclusion that they were used as burrial tombs for the surrounding villages. Evidence also suggests that they have been used in several different ways in the burrial process as well. So while visiting these amazing sites please DO NOT CLIMB ON THE JARS! Phonsavon itself is a pretty small city that closes down early and this leaves you with not a lot of options of things to do. The town itself is pretty mellow. I found only a few restaurants open and not much nightlife other than tossing back some beers around a fire at my guesthouse. 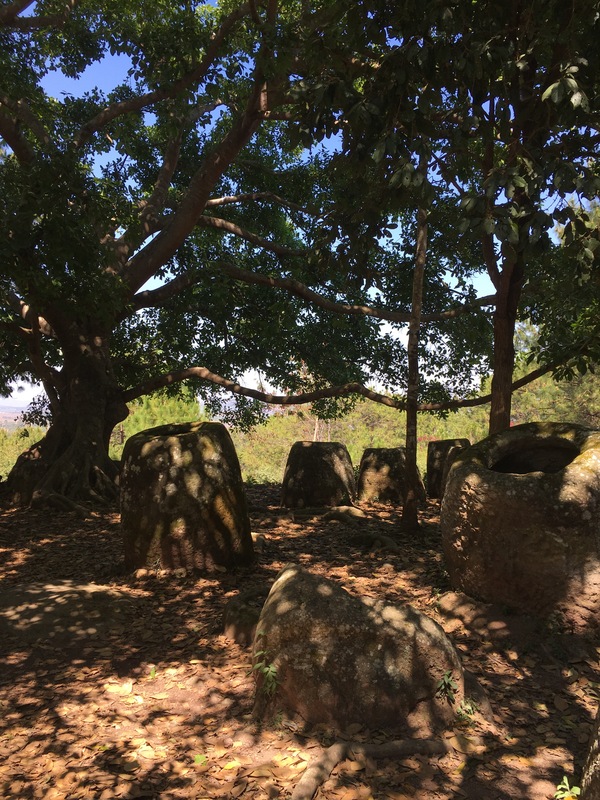 Visiting the plain of jars is the main attraction of the town and one will see why when arriving there. 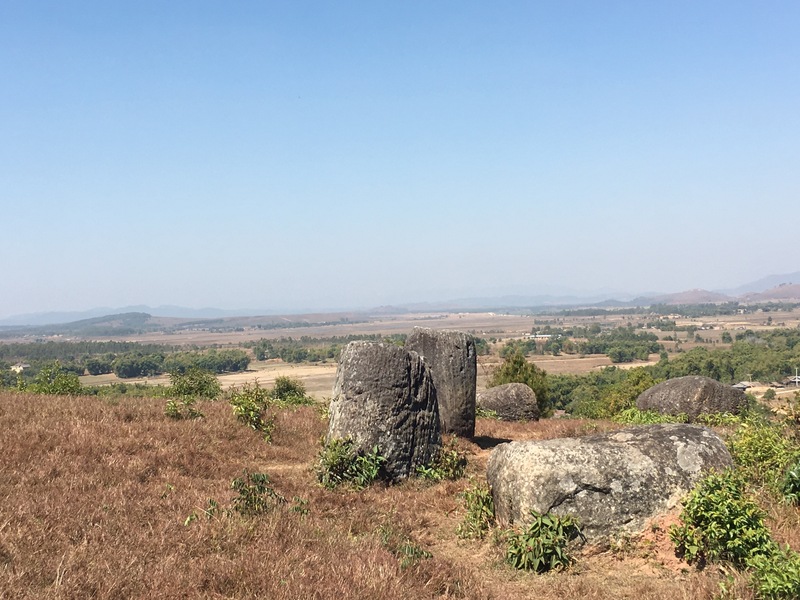 When visiting the plain of jars there are several options of how to get there. You can go on an organized tour, hire a tuk tuk, rent a motorbike or rent a bicycle. Each of these options have their benefits so make sure you figure out what fits your needs. While I was there I decided to rent a motorbike. This cost 100,000 kip on and I was required to leave my passport as the deposit. I tried to leave cash but he wouldn’t have so passport it was. The moped itself was pretty beat up and barely started and none of my gauges worked so I decided to fill up before I left! So be sure to fill up your tank on your way out to the sites so you don’t run out of gas in the middle of nowhere! Getting to the sites is pretty straightforward but Site 3 is a little confusing compared to the other two. 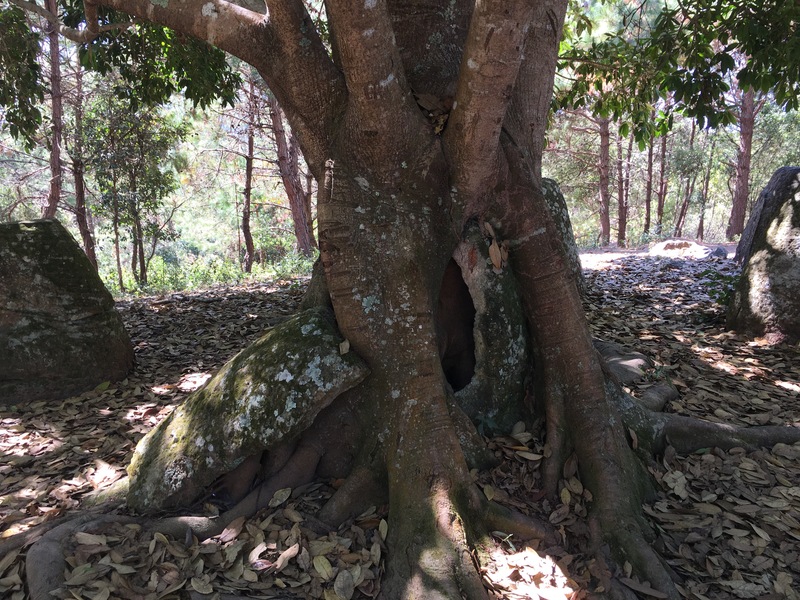 So to help you find your way I decided to write this article to share my experience finding the sites, how to get to them and to share with you what they were like. I decided to start at the furthest site first (site 3) and then work my way back to site one. In the morning I rented a moped and headed out to site 3. 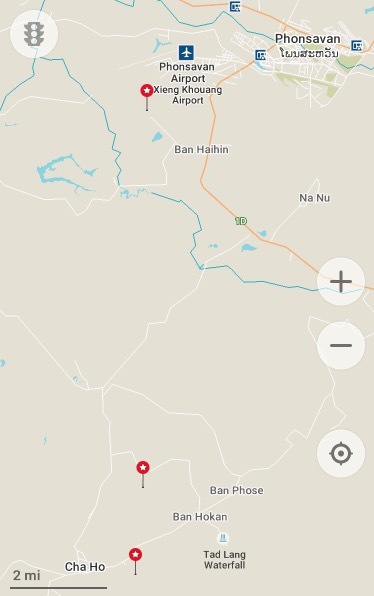 I used the app maps.me because it’s used offline and it works better than google maps in SE Asia. From the center of town it’s about 15 miles to site 3 which will take an hour to hour and a half depending on how fast you drive. The ride took around an hour or so through the country roads with stunning views along the way. 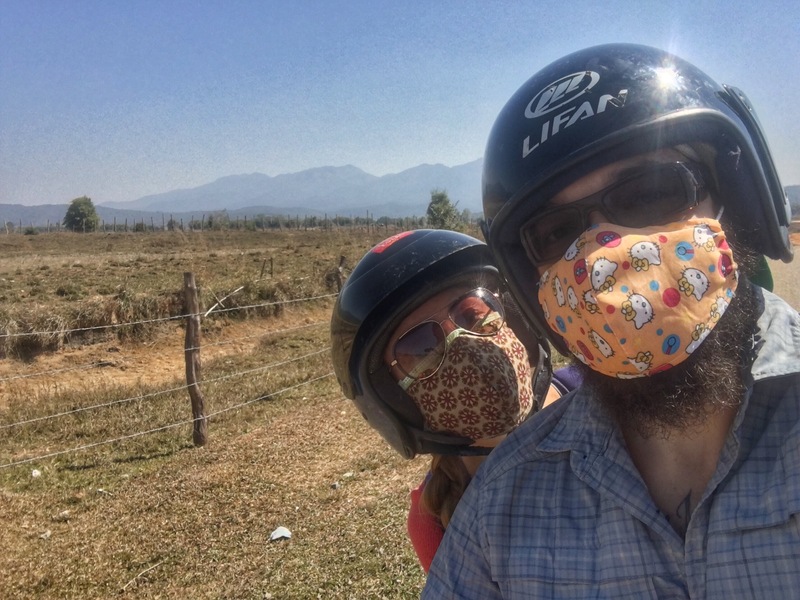 The air is crisp and clean but you still will want to wear a mask while riding because of all the road kick up from passing vehicles. There’s not much local traffic once you pass site one’s turn off so you can really enjoy the views along the way. Pro Tip: bring a jacket because it gets a little chilly due to the altitude. As you can see my beard sticking out the bottom garnered some funny reactions from the locals! After about 45 minutes you will see your turn off for site 3 if you have been using the app then it will tell you the turn off. If not there is a large purple house just before you turn off on the left. Once we went down the road we started looking for the site and we finally found it after 10-15 minutes cruising down some farm roads. Now once we found this sign we parked and paid 10,000 kip each to the elderly man that was working the entrance. It was kind of confusing because he wore nothing to identify who he worked for so all I know he could of just been pocketing the money! 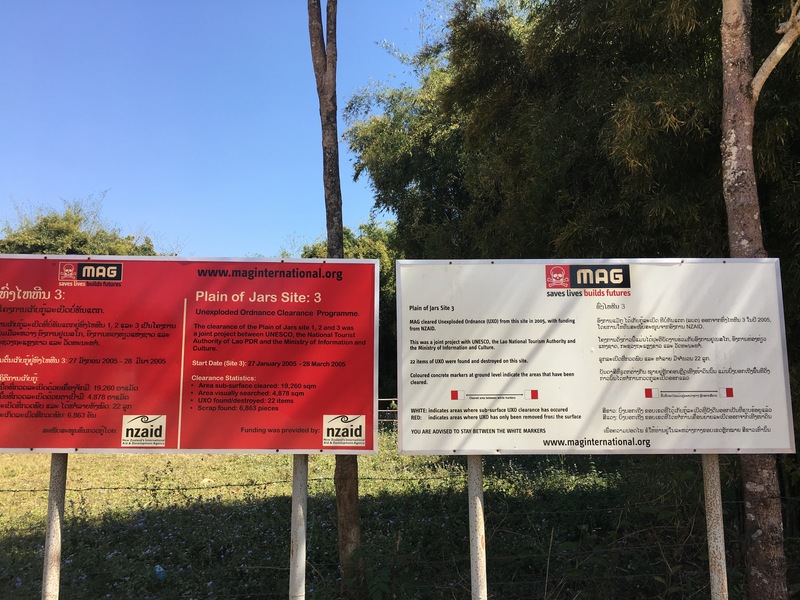 Also, before entering the site be sure the read the MAG warning sign. We parked on the other side of a building and completely missed this walking in! 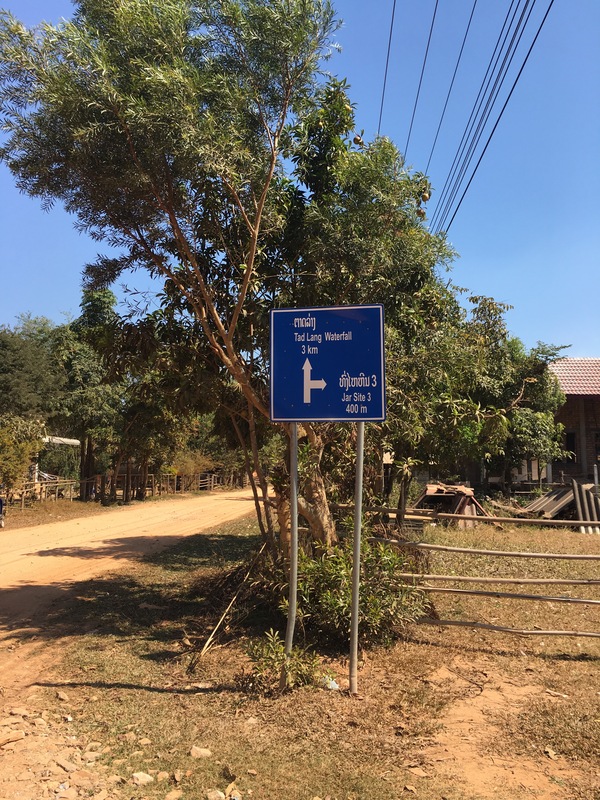 Essentially it’s telling you that this region of Laos is filled with UXO’s and to stay on the paths. We saw this on our way out and being a veteran I understand the consequences of UXO’s so I was very cognoscente of this afterwards. Site 3 is the most confusing one to find of the 3 because it is located through farmland and there is no signs telling you which way to go. So I took pictures to help guide you through it. 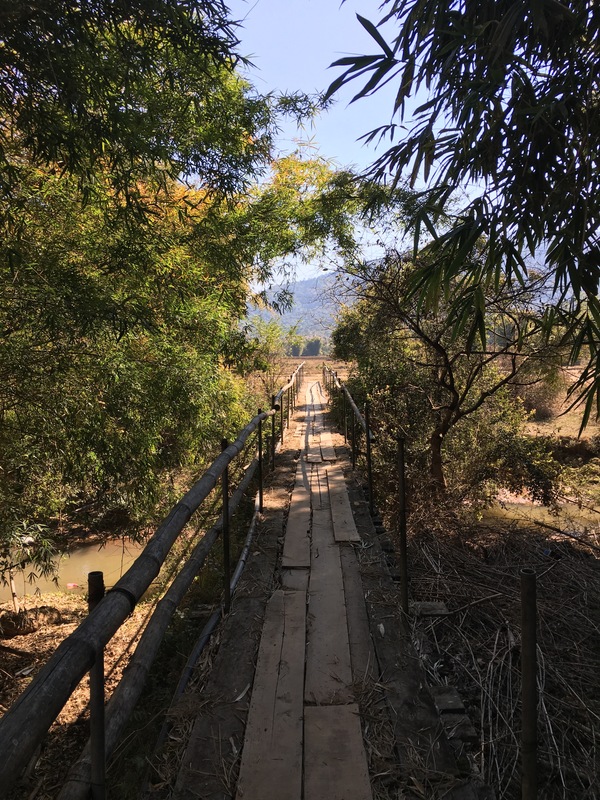 You cross the bridge and follow the path to the right. Follow the beaten path through the field. You will come to the next field and you can see the paths to follow. Both lead to the same place but if it’s wet season one might be underwater. 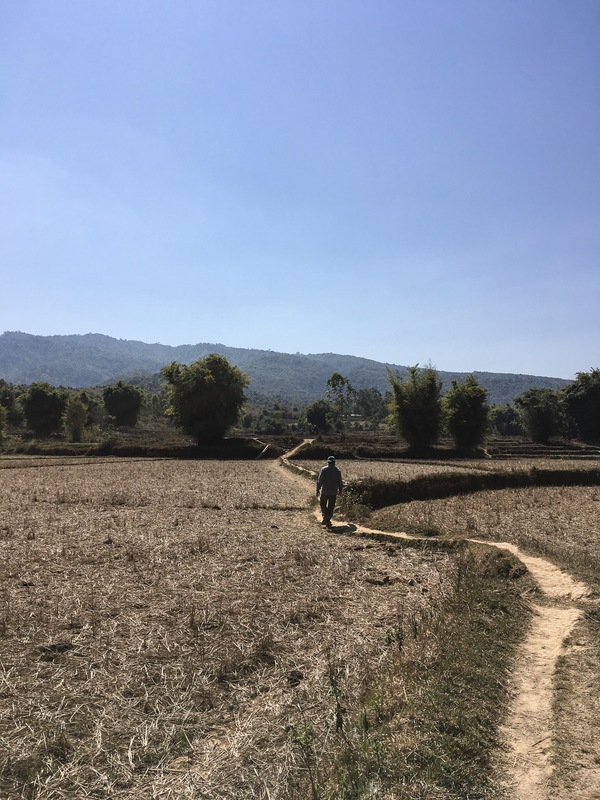 Once you cross through the two fields you will find the path continues between two water filled patties and you walk up the small hill to a clearing. You will see a small building on your right and a fence line straight ahead. In the middle of the fence you will see a small wood structure set up so you can walk up and over the fence. You are now in Site 3! This site is nestled upon a hill in the plains with sweeping views of the area. It was quite and peaceful while I was there. As you stand there taking in the views you will notice the crisp air sweeping through the valley howling as it passes through the jars. The clean fresh air has a noticeable hint of the local live stock. It reminded me of being back in plains of Texas. The beauty of the countryside can be fully taken in when standing in the back of the site. This was my favorite of the trip because it received less tourists than the rest and it felt more personal while explored it. After Site 3 I headed out to Site 2 since it was only a few kilometers away. Getting to Site 2 is pretty straight forward compared to Site 3 and it cost 10,000 kip as well. Essentially just follow the map directions and you can find the site very easily. When I arrived, there was a small parking area off to the right and a path across from it with very distinctive steps leading up. This site is split between to sides of the road you drive in on. The left side of the road has a very cool site on top of its hill. The trees on this site have matured with the Jars which puts on display the merge of nature and man. The site itself is fairly small but makes up for that with the way nature has overtaken it. The site on the right side of the road is wide open with sweeping views of the valley around it. I also has a cool walking path that leads you behind the site that goes through a wooded area. It a nice trail to explore. Visiting site 2 should only take an hour or two depending on how much you decide to explore. After this I decided to ride back to town to eat lunch and relax for a few minutes. Site 1 is the most touristy of the three sites but also the largest. Located only a few miles outside of town it is the closest as well so I decided to leave that last so if the sun went down I didn’t have far to go. When you get to the main entrance to the site you will find the visitors center. 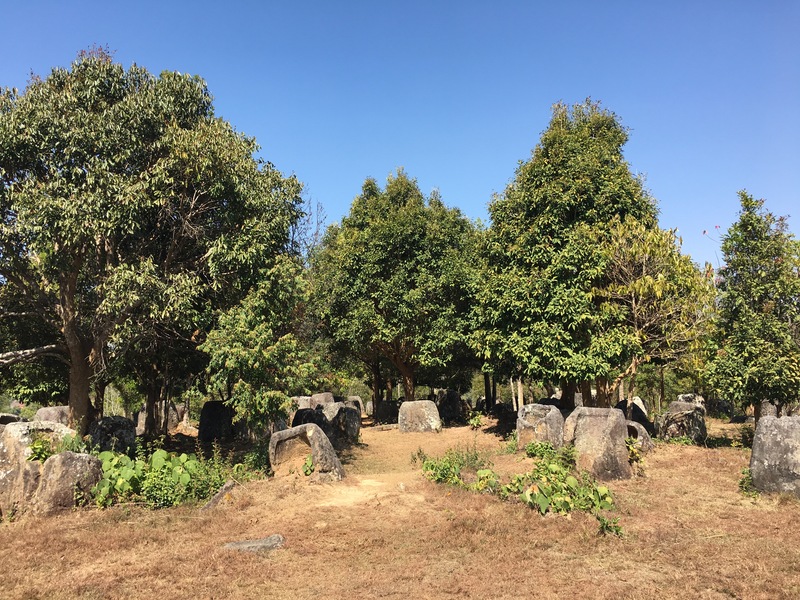 You must pay 15,000 Kip for this site but it also includes admittance to the Plain of Jars museum that is attached to it. Since the entrance is set off away from the jar site you will hop on to a shuttle that will take you a quarter mile to the main path into it. As you get to the first set of jars you will notice right away that it is much more touristy than the other two sites. The site is littered with benches all over which ruins the photo opportunities that you would other wise have. So you must get creative here to capture some good photos! As you look out you will see a big rock formation and the jars below. 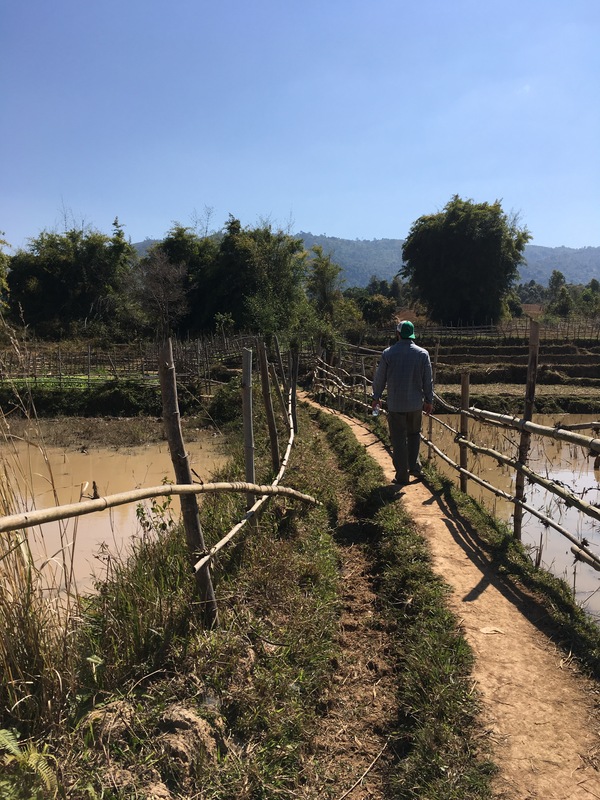 As you follow the path down to the other jars and the rock formation you will notice all the bomb craters left from the Vietnam war. They are scattered all over the site and have a noticeable impact on the area. It serves as a constant reminder of the Vietnam War. Before you explore the jars be sure to walk to the mouth of the cave at the rock formation. It was used as a crematory for the bodies at one point and is pretty cool to see. After visiting the cave you can follow the path around and through the site. It has some really good photo opportunities here! As you explore to the back of the area you will see the path leading up the hill. Follow this to the top for some amazing views of the area. As you get to the back of the hill you will see the area where you were dropped off. You can take the path that leads down that direction. It will come to a split that you can either take to the top of the cave or go down to the drop off area. 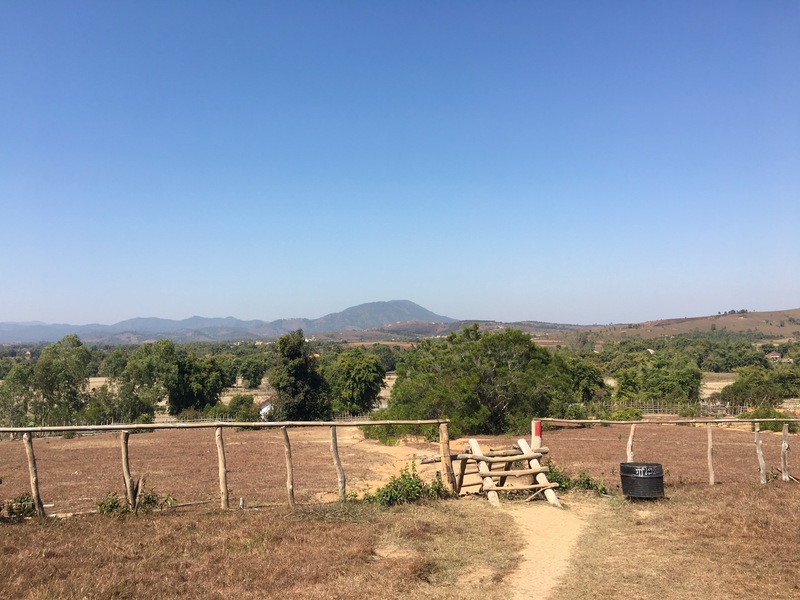 Take the time at this site to feel the effects of the war on the Laotian people and their culture. 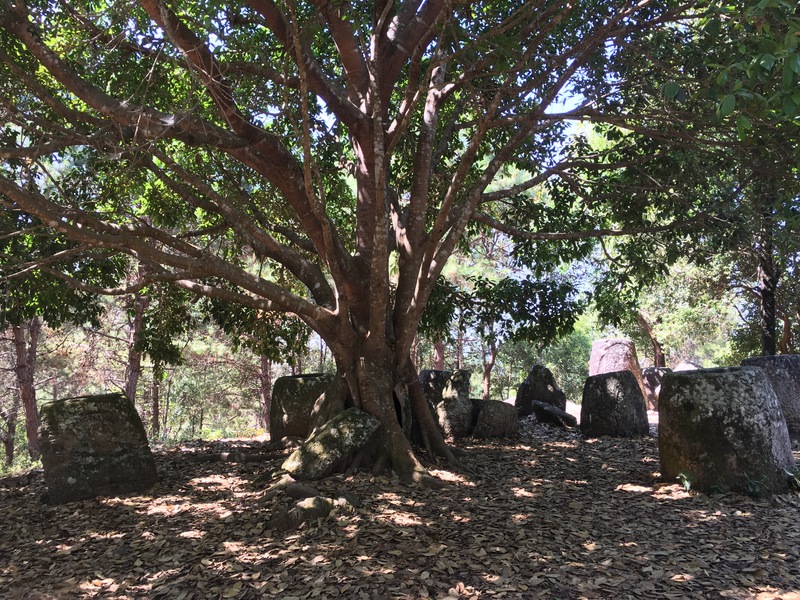 Read the history of the area in the museum located at the ticket office and you will have a deeper appreciation of the Plain of Jars. 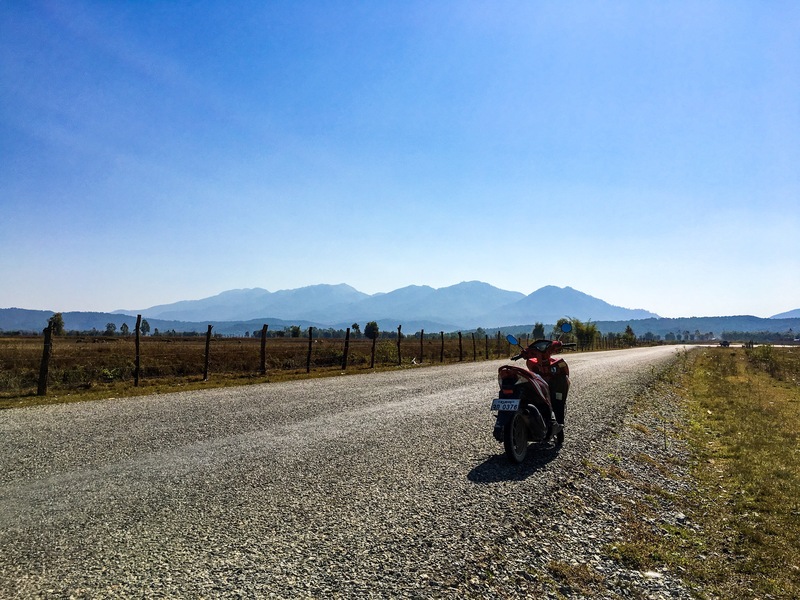 I really enjoyed my time exploring the area and riding through the countryside. I would definitely recommend this to anyone looking to go to this part of the country. Just make sure you take care not to wander off the beaten paths too much because they are still actively destroying UXO’s. While I was there I heard 5 different explosions so be careful and enjoy this beautiful archaeological site! 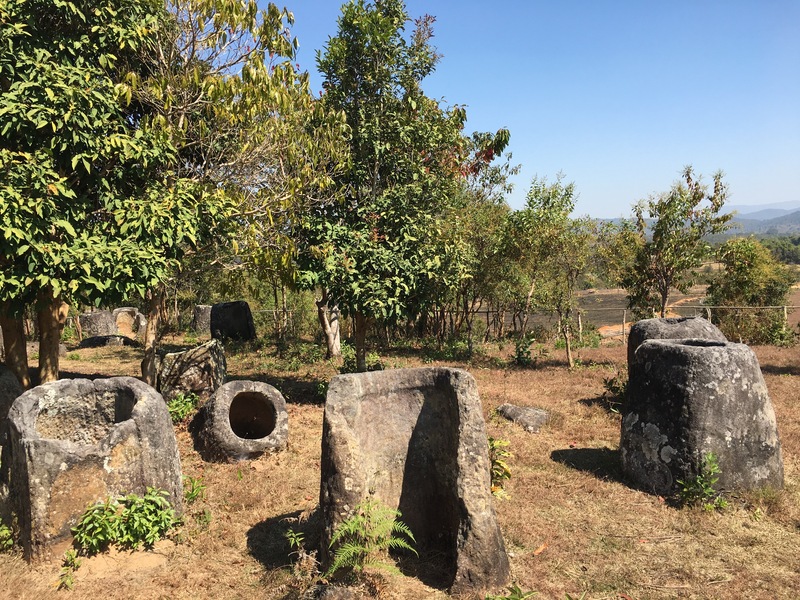 I hope this helps you if you’re wanting to visit The Plain of Jars. Don’t be discourage from renting a scooter and riding out to all three sites on your own because part of the joy in traveling is getting out there and trying new things! Be sure to like and share with your friends!! Also, make sure you bring a good camera and filter for the day! Check out my travel gear for all your needs!